This is the most exciting, challenging a multi-media exhibition that highlights the innovative ways in which artists explore a variety of styles, genres, and movements. of his generation. Honored Artist of Russia (2007). He performs at the Moscow International House of Music – dedicated to outstanding masters of Soviet Song: O.Feltsman, M.Fradkin, A.Ostrovsky, E.Kolmanovskomu, M.Minkov and others. please click on www.paypal.me/olgaroginkin to purchase your ticket in advance. “Sexuality and subconscious is the bridge that leads from visible to invisible…”. She is an artist who recently very actively shows her works at art exhibitions in New York, France, Italy and Spain. Her painting “Purple Rain”, sold at this summer Art Hamptons 2016 Show, has just been published in the September issue of the Blouin Modern Painters magazine. Born in Kiev, Ukraine, Yelena never formally learned how to paint. Yelena Kimelblat started to paint in 2008 and art became a means for Yelena to share with others her vision of life. Yelena’s paintings belong to absolutely new genre… This genre is very much understood by the people who are absolutely new in the world of visual art. Yelena has the uncanny ability to see the unexpected side of the plain and the ordinary. One cannot arrive at this place with reason and logic. Her metaphoric thinking leads her to decisions that are so far from ordinary human associations. That which Yelena is doing doesn’t fit within the understanding of artistic movements and schools of thought. She does not belong to any movement. She is on her own. She gives birth to her art pieces somehow naturally, and they naturally communicate to us that which belongs only to her: her visions of things and happenings – her inner world. This perspective finds a connection with the people who view Yelena’s paintings, because the joy of being with which Yelena lives and works is being conveyed to people. Yelena’s paintings on display in Chelsea Galleries, Museum of Russian Art, private collections. Her art work was selected for “WIDE OPEN 7” Metropolitan Museum of Art National juried art show at Brooklyn Waterfront Artist Coalition. Grigory Gurevich, sculptor, painter, graphic artist, printmaker, and inventor has had more than 400 exhibitions in the United States and Europe and conducted hundreds of sculpture workshops in Italy, Denmark, and U.S. He had studied art in prestigious Academy of Fine and Industrial Arts in Leningrad, Russia. His paintings, drawings and sculptures have won numerous awards and are in public and private collections in the United States, Russia, Denmark, Germany, Croatia, Slovakia, Switzerland and France. His bronze tableau of seven life–size figures entitled “The Commuters”, sculpted in 1985, is permanently installed in Newark Penn Station. mixed media prints has been included in the print collection Hermitage Museum in Leningrad, Russia, New York Public Library New York, USA, Newark Public Library, as well as the Rare Book collection of Library of Saint Bonaventure University. Peterburg, Russia as a part of “Circus” exhibition. His 4 Art books are now in the collection of Library of Metropolitan Museum of Art in New York, USA since June 2016. Alevtina is a many-sided and gifted painter. The main subjects of her works are landscapes, cityscapes, still-lives, genre scenes and flowers. She is a fruitful and industrious painter. Alevtina was born in Leningrad (St. Petersburg) Russia. She took part in over fifty shows in Jersey City, New York, Moscow, St. Petersburg, Russia.. She is an active member of the Art Gallery with the Hudson Artist of New Jersey. Alevtina presented on 49th, 50th, 52d ,60th. Annual Regional Art Exhibits in Bayonne Public Library Gallery where she received four awards. “The Scene at the Bar” (1999). In 2012 he obtained more two painting “Rain on Time Square”(2003), “Three Women (Sally, Mary, Carry)” (2012). Her art works were put on the International Catalogue “Art of Inspiration” and ” Fine Art the Robert Harris Rothschild Collection”. In 2006, Alevtina Ignatyeva published her book “Over Years, Over Distances” by Liberty Publishing House in USA. The happenings and twists of fate narrated in the book are keeping readers intensely interested until the last page. Alex AG is a New York based artist. His digitally modified panoramas largely focus on surrealistic harmony of urban life of large cities: New York, Istanbul, Bucharest, however, large part of the collections is vistas of nature, or single depiction of people, animals and non-animated objects.. His works are offering the new approach to interpretation of reality captured by a camera. Another area to which artist is paying extremely close attention is methods of printing the artwork. Alex employs several processes, including printing on standard metal surfaces, custom print on materials such as leather, steel, stone… The separate area of Alex AG works is printing on transparent and semitransparent surfaces, including multi-layered prints on glass and prints on semiprecious stones, which require illumination for display. She is a Russian artist, based in Brooklyn, NY. Art has always lived in her house, started with her grandfather – who was an artist, a painter-decorator. Her love story with art has began the moment her grandfather handed Iness his brush. This love has been living inside of her throughout the years, constantly reminding of her roots and where she came from. She graduated from Saint -Petersburg University of Technology and Design with a major in Decorative and Applied Arts. Currently she teaches children and adults to paint. Her art work has been exhibited in Chelsea Galleries as well as underground art shows. NY. Elena takes her inspiration from the great Impressionists as well as old masters of the Renaissance period, such as Leonardo da Vinci, Titian and Caravaggio. She is drawn towards the simple, unpretentious and quotidian. Elena strives to capture the mood and color of the surrounding world through her style and personal vision of reality. This sensibility is reflected in her graphic series “Love in three colors” and “Adam & Eve Rebirth”. Each depicts an emotional connection between people, expresses love, passions, and movement as a continuation of life. Elena believes that observation and creativity, as well as hard work and learning, are the keys to her development as an artist. She currently lives and works in New York, NY. Lilya Pavlovic-Dear works under the name of Lilya B.A. in Painting, Frescoes, and Mosaics, Academy of Fine Arts, Belgrade, 1970 British Council scholarship London, 1972; Master of Fine Arts, Chelsea College of Arts, London, 1973 Invited to ‘Painters Week’, Austrian Ministry of Cultural Affairs, 1975 Professor at the School of Fine Arts, U.C.L.A., Los Angeles, 1975 – 1977 Listed in the Bénézit Art Dictionary, Drouot Art Market Quotations, Akoun Art Dictionary Appointed Chevalier Artistique, Accademia Internacionale Greci Marino, Italy in 1998 Silver Medal in the Arts category, Le Mérite et Dévouement Français, 1998 Lilya’s works are in private and public collections in Europe, China, and the USA. Growing up in St. Petersburg, Russia, I was educated by a family of artists. Painting my first painting as a young child I knew that art would become a passion for me. Following in my families footsteps, I attended The Academy of Fine Art in St. Petersburg, graduating in 1971 with a bachelor’s degree. Shortly after, I was nominated and accepted as a member of the Guild of Artists in Russia. Over the years, I have mastered new functions of rhythm and colorand have carefully created my artistic “self”. My paintings are inspired by the forms and laws of magnificent mother nature and display a world of charm and beauty. I created my world of infinite techniques, textures, materials, perfection of composition, richness and harmony of the palette. I work with a diverse set of mediums ranging from oils and acrylics to pastel and enamel. My artistic passionexpands tocreate elegant jewelry composed of stones and coral from around the world. For the last forty seven years, I have participated in many exhibitions and the hundreds of my works have been placed in major museums and private collections. Svetlana Levin-Kerre, an award-winning Russian-American artist. 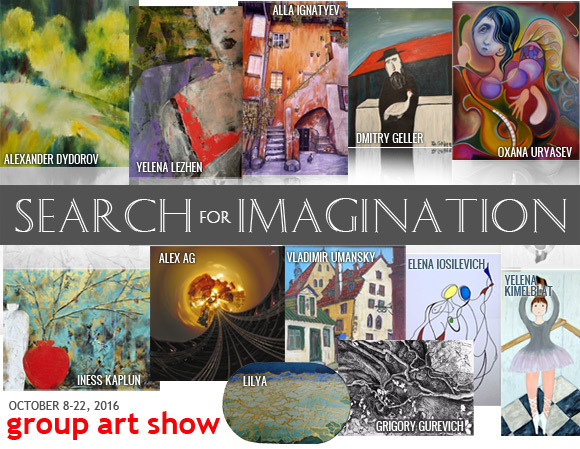 Svetlana creates art challenging the imagination and continually stimulating both senses and thought. After graduating from the Saint-Petersburg College of Civil Engineering and Architecture with a degree in Architecture, her first work was as an interior and display designer for the fashion store chain, “Leningrad Odezda,” in Saint-Petersburg. She attended the Graphic Design program at the Fashion Institute of Technology in New York and has worked for numerous American publications and advertising agencies as a Graphic Designer and Art Director. Her creativity demonstrates a sustained quest for interpreting life; its emotions, its beauty, motion, strength and fragility. She works with multiple mediums including oil, acrylic, gouache, pencil, ink, photography and collage, transforming colors and textures into expressions interesting, introspective, innovative and unique. Svetlana currently resides and works in New Jersey. Dmitriy was born in Odessa, Ukraine. Dmitriy Geller’s work is owned and showcased worldwide in countries such as USA, Ukraine, Israel, Germany, and Russia and his work is very nostalgic of Jewish heritage past and present. He is a self-made artists who specializes in naive art style with elements of primitive liner. His style emerges from a long tradition of Jewish folk art.Looking at these primarily self-taught forms of expression offers inspiration and assurance that his arts holds a prominent place in Jewish civilization. Dmitry’s work has been exhibited in many exhibits and his art is being preserved in many collections of Jewish Art. There’s a fusion of culture and creativity in all his work.